A manual tile cutter can make getting clean cuts on tiles easier for both interior designers and seasoned DIY professionals. With no assembly required and minimal clean up, a manual tile cutter is the ultimate tool for those who value efficiency. If you’re ready to invest in a tile cutter that is reliable and gets the job done quickly, take a look at our picks for the best manual tile cutter. What is a manual tile cutter and who needs one? How do I use the best tile cutter? Our top pick for the best manual tile cutter is the QEP 24-Inch Manual Tile Cutter with Tungsten Carbide Scoring Wheel. The QEP manual tile cutter comes with dual chrome plated steel rails and height-adjustable 4-position wheel. With a 7/8" titanium-coated tungsten carbide scoring wheel and linear ball bearing slides, this manual tile cutter provides the smoothest possible scoring. Paired with a bicycle grip handle and side opening for double checking alignment, we feel this is the best choice for the consumer’s money. It also sports a height-adjustable 4-position wheel for easily maneuvering to cut various sized tiles. As with all VonHaus products, the company offers a free 2 year warranty if you register the manual tile cutter within 30 days of buying it. The manual tile cutter is, easy to use, convenient for virtually any location and perfect for small tiling projects. This complicated looking tool is nothing to be afraid of, because while it might look intimidating, even the most beginner level users can learn how to get clean cut tiles within minutes. Cutting tiles to the right size and then leveling them with a tile leveling system is crucial in tiling projects. While the need to cut tile seems like the obvious reason for investing in this tool, there are many more details that should be considered first. A manual tile cutter is a tool used for scoring and evenly breaking tiles that are too big or call for a specific measurement. This is a handy tool for anyone replacing the tile backsplash in their kitchen or renovating the bathroom tile floor from scratch. It can be valuable to have a tool that you know will make a clean cut without cracking or chipping each time, especially when you have only the exact amount tiles you need. 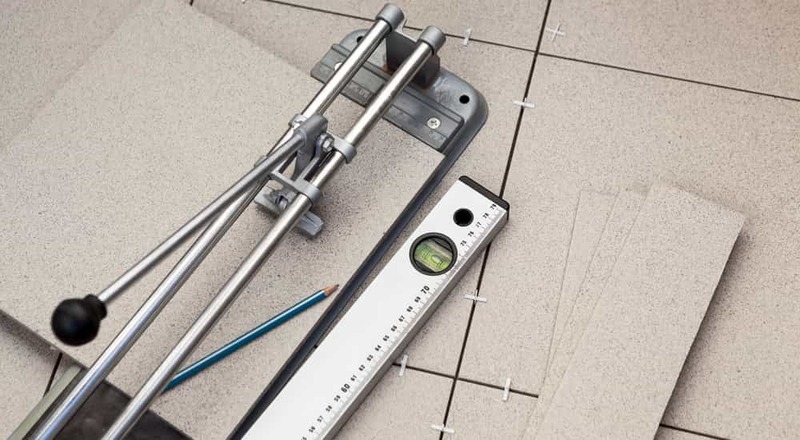 If you find yourself needing your last few tiles cut down to different measurements to finish off your project or just need one tile downsized to fit in an awkward spot, a manual tile cutter will be the tool you reach for to get the job done. A manual tile cutter works by sliding a piece of tile under the rail bar and then sliding the scoring wheel across the top of the tile, scoring a line where you want the tile to split from. Then, without moving the tile, lift up and then press down firmly on the breaker bar to allow the tile to break along that line. To get the best results when using a manual tile cutter, it’s important to remember to make sure that the tile is lined up and even against the edge of the cutter before pushing the scoring wheel across. Manual tile cutters are often used for smaller projects, but that doesn’t mean they can’t pull their weight when it comes to heftier tiles. However, every tool has a limit, so it’s important to know what size tiles you’re working with in order to choose the best manual tile cutter, as many of them recommend not using any tile thicker than ½. Some of these cutters also have different specifications for cutting tiles horizontally and diagonally so for more freedom, it could be best to invest in one without the size restriction for diagonal cuts. Odds are you already know what size you need to cut your tile down to, but pulling out the tape measure every time can quickly become a dreaded hassel. Choosing a manual tile cutter with an engraved and easy-to-read measurement guide can help make the cutting process go much faster. You’ll also want to pay attention to whether or not the tool uses the metric system or the standard system depending on which one you’re calculating measurements in. Some tools, like the Sigma 2B3 66mm Metric Tile Cutter, have presets for common measurements and are available in both Metric and Imperial system options. One of the most crucial parts of guaranteeing a clean cut on your tile is ensuring that the tile does not move between finishing the score and bringing down the breaker bar for the actual cut. Rubber padding, or something of the likes, installed on the cutter’s base where the tile sits to prevent it from sliding could be one of the most important variables when it comes to choosing the best tool for your project. You may also want to pay attention to the durability of the rails, making sure that they are aluminum-based or made of another durable material to guarantee that they won’t flex or shift during your score. If you’re using larger tiles, a helpful addition to your manual tile cutter may be the feature of extendable “arms” that swing out from under the base for added support on the sides of the tile. The goal when cutting tiles with a manual tile cutter is to score only one time and be able to snap the tile with a clean cut. Scoring wheels come in sizes of ¼ in (6mm), 5/16 in (8mm), 13/32 in (10mm), ¾ in (18mm), and ⅞ in (22mm). The smaller sizes are ideal for ceramic and glazed tiles that are prone to cracking because it creates a shallow line. You can go a bit deeper with a narrower 5/16 inch wheel for floor tiles and porcelain. For durable ceramic stonewear, a shallow but wider cut by a ¾ inch wheel. Wheels that are bigger than these are better for scoring multiple times on rougher textured pieces. Wheels can also come in a variety of materials, but most are available in an extremely durable carbide option, allowing the wheel to last longer and make sharper cuts for a more consistent amount of time. Most manual tile cutters also have wheels that are replaceable. While carbide is a good option, it isn’t invincible and wheels should be inspected and switched out regularly for the best results. While a manual tile cutter isn’t the only option for slicing tiles and it can only perform straight cuts, offers many key advantages. Because this tool is not electric and not overly large or heavy, it can be moved to wherever your workspace is without the hassle of not being able to lift it or needing to be close to an outlet. The manual tile cutter, unlike a more complicated tool such as the wet saw, only requires little to no prior skill or experience. It also does not need to be assembled and disassembled each time, making it convenient when you just need to pull it out for one or two cuts. Plus, you only need to make a small mark of where you’re planning to make a cut rather than an entire line drawn from top to bottom on the tile. It also requires minimal clean up because of the clean break. Whereas other projects involving saws can require diligence and precision, the durable rails found on manual tile cutters make scoring a straight line effortless. Without requiring more than a bit of pressure, it shouldn’t take longer than a few minutes to place, line up, score and cut tiles. Even though the process is simple, working with tiles still involves potential sharp edges and other hazards that users should be aware of and take precautions against before operating the tool. Do not attempt to cut materials not specified or encouraged by the manufacturer. This can lead to sharp, broken pieces and the tool’s inability to perform a clean cut. Wear goggles or another form of protection to shield your eyes from broken tile pieces that could be forcefully thrown. Never attempt to run the scoring wheel over anything besides the tile intended for scoring. After using, store your manual tile cutter properly out of the way to prevent injury. Do not allow children to play with or operate this tool. Manual tile cutters will last much longer and prove to continue being beneficial when they are well taken care of. Inspect and replace the scoring wheel regularly. A dull or damaged wheel can lead to improper and inaccurate scoring. Regularly wipe debris off of the scoring wheel’s path to ensure the next tile lays level. Never clean, add oil to, or lubricate your tool in any way other than that specified by the manufacturer. To reduce the amount of small chipping on the glaze, ensure that you are beginning your score with a consistent amount of pressure from the very beginning edge to the very end edge. ​Q: Can a manual tile cutter cut glass? A: A manual tile cutter can be used to cut glass but because of the fragility of glass in comparison to tile, there is the risk of chipping. The manufacturer will often have a list of compatible materials listed that you can refer to. Q: Can a manual tile cutter cut wood? A: Manual tile cutters are not usually used to cut wood strictly because of the limited space available to work with. If you’re working with a piece of wood small enough for a tile cutter, you want to ensure that you’re working with a carbide-tipped blade, as anything with a harsh grit can damage the wood. Q: Can a manual tile cutter cut porcelain? A: Most manual tile cutters can cut porcelain as it is a common material for tiles to be made of, but always refer to the manufacturer’s list of compatible materials. Q: Can a manual tile cutter cut brick? A: It is not encouraged to cut brick with a manual tile cutter. Q: Can a manual tile cutter cut granite? A: It is not encouraged to cut granite with a manual tile cutter. Q: Can a manual tile cutter cut laminate? A: Laminate can be cut with certain manual tile cutters but, because of its size, often requires a guillotine-style laminate floor cutter. It is still a good idea to always refer to the manufacturer’s list of compatible materials first. Q: Can a manual tile cutter cut pavers? A: Most manual tile cutters can cut pavers, but always refer to the manufacturer’s list of compatible materials. We feel the QEP 24-Inch Manual Tile Cutter with Tungsten Carbide Scoring Wheel is the best choice for the consumer. The QEP manual tile cutter allows users to score and cut tiles simply and efficiently via the 7/8" titanium-coated tungsten carbide scoring wheel and linear ball bearing slides. It also provides rubber lining to prevent marring or shifting tiles as well as a comfortable handle to make applying pressure nearly effortless. For larger tiles, it has an extension on either side that swings out to support the extra tile width. To finish it off, it provides a side opening for ensuring that your tile is lined up with the measuring guide before scoring. ​​However, if you’re looking for a more budget-friendly option, the QEP 14 in. Rip Ceramic Tile Cutter with 1/2 in. Cutting Wheel offers most of the same benefits. While it can’t cut tiles that are quite as large as the QEP 24-Inch can, it has the added benefit of being lightweight, making it convenient and easy to carry from place to place. If you’d like to settle in the middle, the Brutus 27-Inch Rip and 20-Inch Diagonal Professional Porcelain Tile Cutter with 7/8-Inch Cutting Wheel is a good option as well, offering the extension arms for large tiles, which it can handle up to 27 inches.